Ballad of Bapu,Flights from my Terrace and Where are the Lilacs? It is with the objective of rediscovering life that an author pens the real-life stories of high school friends after thirty years. Each of the stories in the collection is centred on the theme of reunion experienced by his friends in various stages of their lives. He invites his friends to attend a function, and the readers join in too, resulting in an unexpected, yet cherished high-school reunion. Thereafter, twenty stories unfold, some full-length stories, some others, flash fiction or micro-tales.The stories encompass a wide gamut of human emotions, exploring relationships between friends, lovers, mother and son and more. 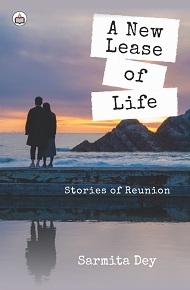 The author is hopeful that his friends would find in their stories, the closure in their lives that they were looking for, a reunion with their own selves, for eventually in each story, the protagonist experiences a new lease of life in the end. Sarmita Dey holds a Master’s degree in Economics from Calcutta University. In spite of the busy schedule at her work place and at home, where she gives quality time to her family, she is a dedicated writer, penning down lines for her stories and poems whenever she finds time. Her creative instincts, imagination, love for nature and travel have all honed her writing skills.Her articles and stories have been published in magazines and online;her short story is part of the published anthology, Darkness there and something more. A New Lease of Lifeis her debut book. Though Kolkata continues to remain her first home, she has been a resident of Mumbai for the past eight years and is indebted to the city and its endearing people for helping her nurture her passions.